Burger King's "Peace Day Burger" to be available exclusively in at one Atlanta area location starting at 11 AM. 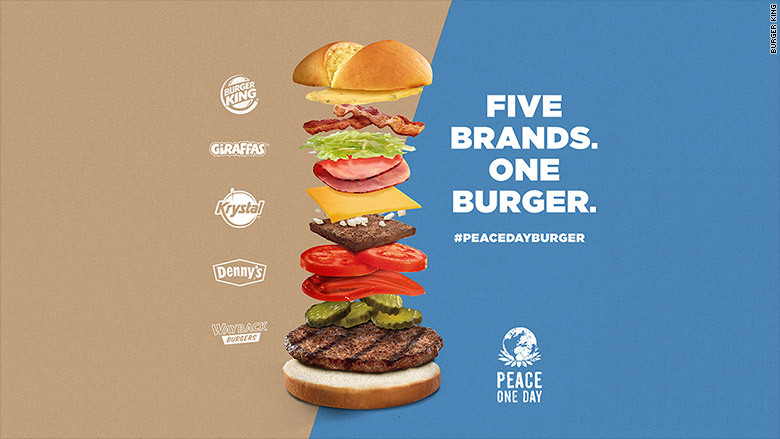 In case you missed it, Miami-based Burger King IS going forward with its previously announced "Peace Day Burger," and is still opening it in Atlanta, but without the cooperation of Oak Brook, Illinois-based McDonald's. 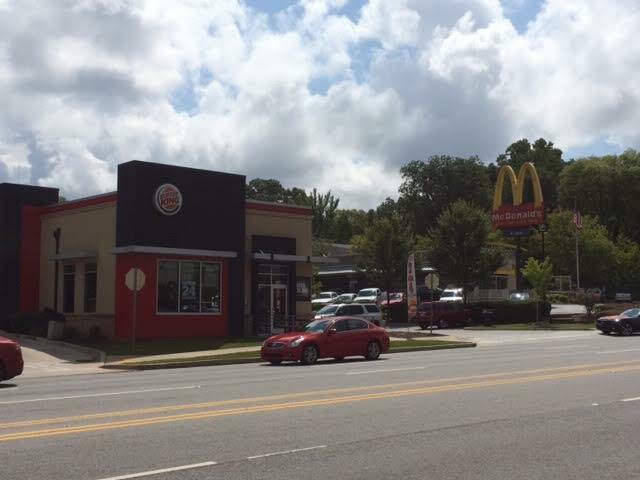 The "pop up" restaurant will be located adjacent to Burger King's existing restaurant t 1122 Northside Drive, a few feet from an existing McDonald's. 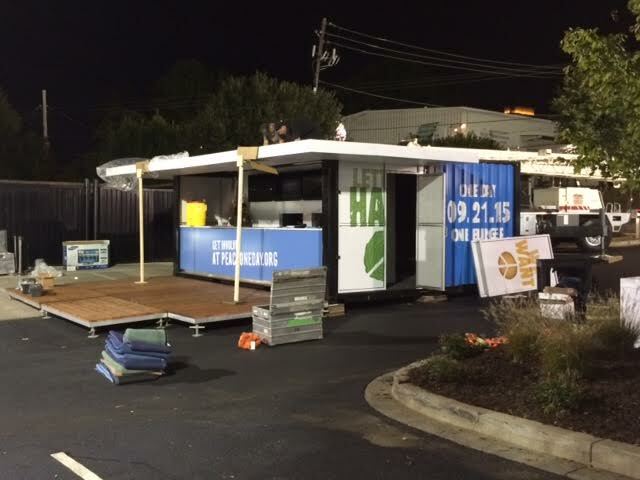 The pop up restaurant will be located to the rear of the restaurant's parking lot, close to Hemphill Avenue. The location, a franchised restaurant, was selected when the plan was to include McDonald's, as it was centrally located between the headquarters of McDonald's and Burger King. Additionally, the Burger King restaurant sports the chain's more contemporary look, having been extensively renovated a few years ago. While news of the promotion has been extensively covered in national media, little attention has been given locally (thus far) to the fact that the event will take place in Atlanta. The location is close to CNN, Georgia Tech and the CBS local affiliate, WGCL CBS 46, so I would think at least one of them will have coverage of the event. 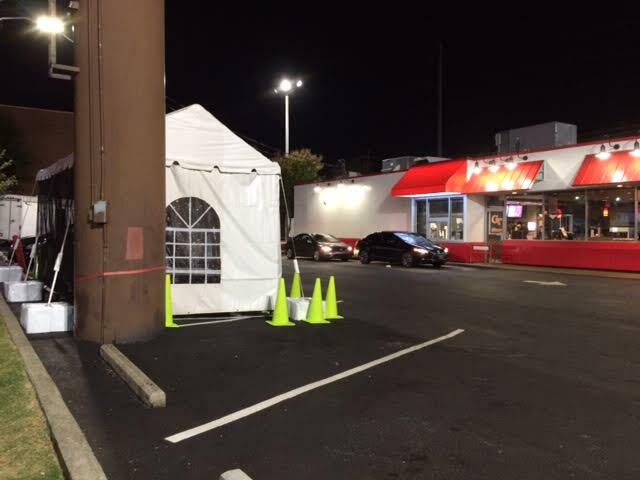 I made a number of trips to Burger King between Sunday afternoon and Monday morning to chronicle the "pop up" eatery coming to life. As of 5 PM on Sunday, there was nothing to be seen on site and the only building permit on file with the city of Atlanta was for a "40 KW generator (grounded)" dated September 16th. I did observe what looked to be executives from the other participating restaurants being given a brief rundown of the operation and the Burger King kitchen adjacent to where the event will take place. 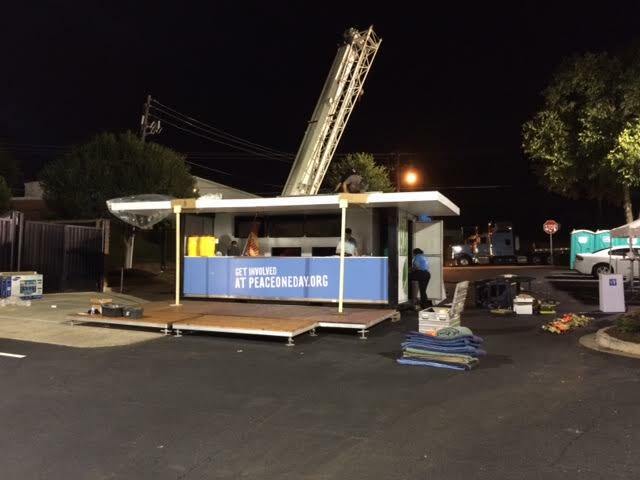 The restaurant started to take shape around 11:30 PM when a tent and other event supplies arrived. 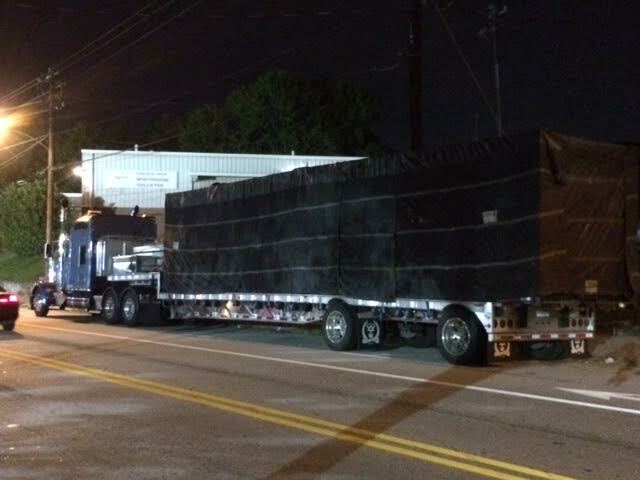 Also nearby, but not yet set up, was the pop up itself, sitting wrapped atop a tractor trailer. On my follow up trip to the restaurant at about 6:15 AM this morning, the pop up was in place, and there were a number of people working to prepare it for the day. The Hemphill Avenue access to the restaurant will be closed to all traffic, as will Burger King's Drive-Thru given the congestion that is expected. The restaurant will serve "free" burgers today, September 21st, starting at 11 AM and will continue serving until 6 PM or until they run out. 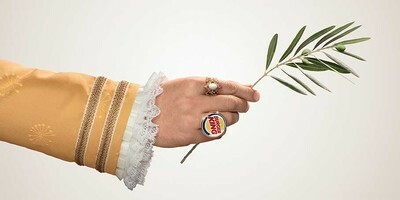 Burger King first proposed its Peace Day partnership August 26 to temporarily join forces with its biggest competitor — McDonald’s — to drive awareness for World Peace Day, September 21. 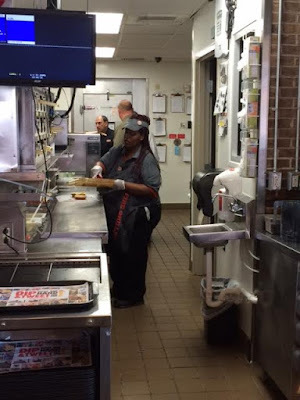 The proposal was simple: partner to serve the “McWhopper,” a burger combining the best of each brand’s signature burgers from a single pop-up restaurant in Atlanta (a location equidistant to both Burger King and McDonald’s headquarters.) McDonald’s new CEO Steve Easterbrook declined the public offer, adding "A simple phone call will do next time." Following McDonald's refusal, Burger King announced September 1 it would instead partner with Krystal, Denny’s, Giraffas, and Wayback Burgers for the charitable event. Of the new partners, two are headquartered in the south. 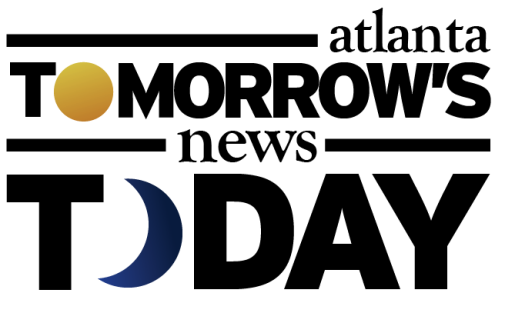 Krystal is based in Sandy Springs, having relocated to the Atlanta suburb in 2013, after calling Chattanooga, Tennessee home since 1932. Denny's is based in Spartanburg, South Carolina, about three hours from Atlanta. Lesser known Giraffas and Wayback Burgers are based in Brazil and Cheshire, Connecticut respectively. Giraffas' only domestic presence is a handful of locations in central and south Florida. Wayback Burgers has a single location in Savannah, Georgia with a second coming later this year to Braselton. While the specific Atlanta location of the pop up was chosen given its proximity to the neighboring McDonald's, it's also across the street from now participating restaurant, Krystal. A large tent was seen in the parking lot of Krystal that will reportedly be used to prep their burger patties for inclusion in the Peace Day Burger. The other participating restaurants will reportedly have food trucks along Hemphill to prepare their portions of the burger. The burger will include elements of the Burger King's Whopper, Denny's Bacon Slamburger, Wayback's Wayback Classic, Krystal's cheese Krystal, and Giraffas' Brutus. The companies said they will also make an unspecified donation to the group Peace One Day. 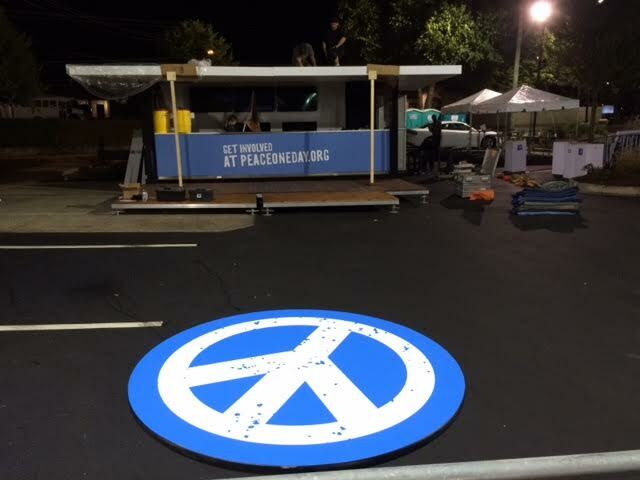 The pop up will serve only the Peace Day Burger, with drinks and condiments available for sale inside the Burger King restaurant. Surprisingly, Wendy's, seen by most as one of the top three fast food burger players along with Burger King and McDonald's, was neither offered inclusion in the Peace Day promotion, nor did they publicly express a desire to participate.  For its part, McDonald's announced Sunday that they are leading a "multi-million dollar" advertising campaign to promote the United Nations World Food Programme and benefit refugees of conflicts in the Middle East. Although I made multiple visits to the restaurant in advance of the promotion, my bill-paying job will prevent me from attending the event itself. 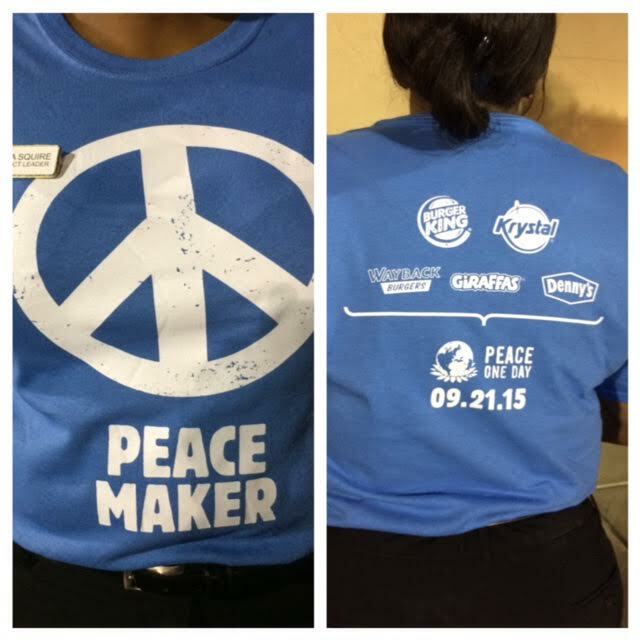 If you are like me, you can still get in on the conversation by using hashtag #PeaceOneDay. 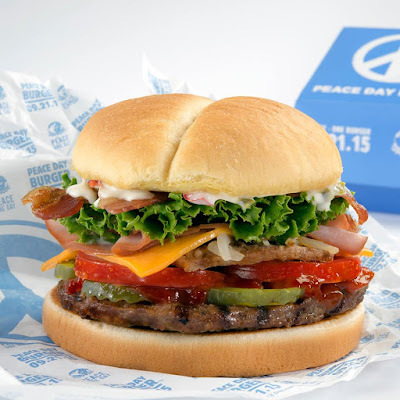 Will you make an effort to get your hands on a Peace Day Burger? 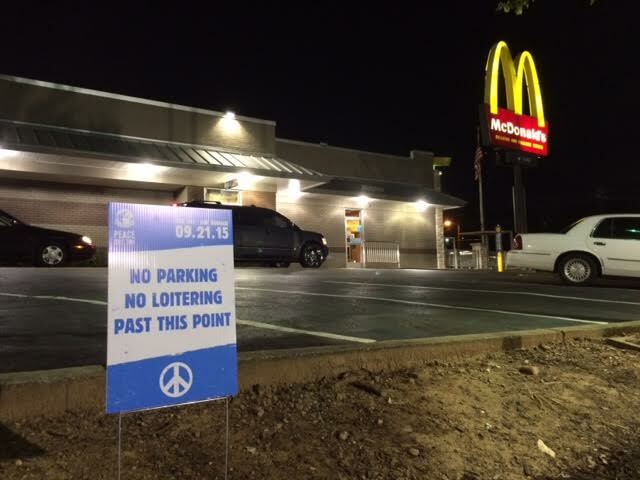 What do you make of McDonald's recent announcement and Wendy's apparently exclusion? Would you still like to see a McWhopper created? I will make all efforts to stay far away from that area today. You mention the word free and people lose all rationality. They are willing to sit in line for a very long time to save a few bucks for a Burger, not to mention the time it will take them to get there.